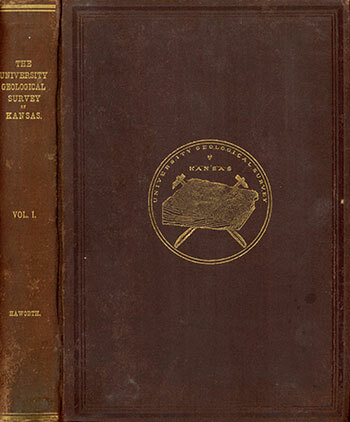 Originally published in 1896 as University Geological Survey of Kansas Volume 1. This is, in general, the original text as published. The information has not been updated, and spelling has been kept in the style of the time. An Acrobat PDF version (90 MB) is also available. SIR—I have the pleasure of submitting to you the following report on the stratigraphy of the Carboniferous of Kansas and allied subjects, which will constitute volume I of the rereports of the University Geological Survey of Kansas. The act of the Kansas Legislature in 1889 making appropriations for the current expenses of the State University included a provision that a geological survey of the state should be one of the functions of the University. In 1895 the Board of Regents of the University, by special enactment, declared the State Geological Survey organized, and the Chancellor of the University was made its director, ex-officio. Prof. S. W. Williston was placed in charge of the department of Paleontology, Prof. Erasmus Haworth of the department of Physical Geology and Mineralogy, and Prof. E. H. S. Bailey of the department of Chemistry. Active operations along the line of a geological survey, however, were begun in the summer of 1893, under the direction of the department of Physical Geology in the University. Arrangements were made by which advanced students in this and other institutions might receive credit in the University for work done while engaged upon the survey. Mr. M. Z. Kirk, of Iowa, Mr. W. H. H. Piatt and Mr. C. E. McClung, students of the University, were put into the field for the summer. Mr. Kirk ran a section along the Neosho river from the south line of the state to its source, and along the Cottonwood river to Clements, a report of which constitutes chapter III of this volume. Mr. Piatt did considerable areal work in tracing the outcroppings of certain formations and in studying the conditions along the Verdigris river, Mr. McClung devoted a number of weeks to an investigation of the coal mining areas, principally in Cherokee and Crawford counties, and in the preparation of a map locating the various coal mining plants. This map has not yet been published, but has already had considerable additions made to it and will ultimately form the basis of a mining map for the southeastern part of the state, to be published in volume III of these reports. The writer spent considerable time during the same summer in assisting the three gentlemen named and in work of a general character in stratigraphy in the southeastern part of the state. He also ran a section along the Santa Fe railroad from Coffeyville to Lawrence, an account of which constitutes chapter VII of this volume. During the summer of 1894 much more work was accomplished, a larger number of men were engaged, and the area studied was greatly extended, Mr. George I. Adams devoted about 10 weeks to field work, during which time he ran a section along the south line of the state from Galena to Wellington, an account of which constitutes chapter I of this volume. The Rev. John Bennett, of Fort Scott, ran a section principally along the Marmaton river from the east line of the state opposite Fort Scott to Yates Center, and one from Kansas City to McFarland. The account of the former constitutes chapter IV of this report, and of the latter a portion of chapter VI. Mr. Bennett also devoted a number of weeks to a study of the invertebrate paleontology of the Coal Measures, using materials from his excellent private collection, from the museums of the State University, and that gathered by the workers in the field. Portions of the information thus gained have been used in the different chapters just mentioned while the whole has been summarized in the form of a catalogue of fossils arranged first from the biologic point of view and next by counties, which constitutes chapter XV of this volume. It is exceedingly fortunate for the state that the services of Mr. Bennett were secured. For a long number of years he has been devoting such time as he could spare from his professional duties to the study of the Coal Measure fossils, and is thoroughly familiar with the Coal Measure fauna of Iowa, Missouri, Kansas, and the Indian Territory. During the Same summer, Mr. John G. Hall ran a section along the Marais des Cygnes river, from the east state line to Alma, intersecting the section from Kansas City to the same point. The report of his work constitutes chapter V of this volume. Mr. J. Z. Gilbert also devoted a few weeks to field work, during part of which time he was assisting Mr. Hall, and part of the time assisting the writer with the section he ran from Baxter Springs to Kansas City along the line of the Kansas City, Fort Scott & Memphis railroad. With the enactment of the law by the Board of Regents of the University formally organizing the University Survey it appeared that operations should be considerably expanded. An attempt was therefore made to unify the operations of the different geologists in the state who were not connected with the University. At the same time the State Board of Irrigation asked this department to prepare a map of the state showing the areas under which there were grounds for a reasonable hope that water existed to a sufficient extent to be of importance in irrigation. The work was expanded so that a total of 12 assistants were placed in the field, some of whom were students of the University while others were not. Mr. Adams and Mr. J. H. Patton were placed in the southwest to study the stratigraphy and areal geology of that part of the state. In addition to his work Mr. Adams ran a section across the Permian from Manhattan to Abilene, a part of which forms the latter part of chapter VI of this volume. Mr. Walter Griffiths and B. L. Pampel were likewise placed in the northwestern part of the state. Mr. W. R. Crane was sent to the coal mining districts in Cherokee and Crawford counties to study the details of the stratigraphy of the Coal Measures, the mining operations and machinery, and to gather an extensive series of samples tor chemical and physical examinations in the laboratory. Of this number, Mr. Adams had become a graduate student in Princeton University, Mr. Patton and Mr. Griffiths were undergraduates, while Mr. Pampel and Mr. Cranewere graduates of this University. In addition to these, Mr. Earl G. Swem, of Delhi, N. Y., was placed in the northeastern part of the state to study the glacial deposits and glacial phenomena; Rev. Mr. Bennett continued his stratigraphic work by running a section along the Missouri river from Kansas City to the Nebraska line, an account of which will constitute a part Qf chapter II of this volume; Prof. E. B. Knerr, of Midland College, Atchison, ran a section from Atchison westward to the top of the Permian, the results of which appear in this volume as chapter VIII; Dr. S. Z. Sharp, President of McPherson College, devoted a large portion of the summer to a study of the Dakotah Cretaceous, during which time he traced the boundary between the Permian and the Dakotah from the north line of the state southward to a point opposite McPherson, and also ran a section along the Smoky Hill river the entire width of the Dakotah; Prof. J. H. Hamley, also of McPherson, likewise traced the boundary between the Dakotah and the Fort Benton formations from the north line of the-state to as far south as Lincoln; Mr. W. N. Logan, a student of the University, ran a section near the north line of the state from the Permian to the western boundary in Cheyenne county, and one along Smoky Hill river from the western side of the state to the eastern limit of the Fort Benton, in addition to which he did considerable detail work in the extreme northwestern part of the state in connection with the work done for the State Irrigation Board, and also continued the boundary between the Dakotan and the Fort Benton from Lincoln to the Arkansas river. Mr. M. Z. Kirk has devoted about two months to field work in connection with the study of salt and salt deposits of the state, a problem which has been assigned to him for special investigation. It is hoped that we will soon be able to issue his report, probably as a part of volume III, giving a detailed account of the geology, chemistry, and technology of the salt deposits and salt industries of our state. During the earlier part of this season the writer gathered considerable new information concerning the oil and gas deposits of the state; but later found it necessary to devote all of his time to a general supervision of the field work. This required extensive traveling all over the state and a more or less minute knowledge of the workings of each party and the detailed conditions surrounding them. He is, of course, to a great extent responsible for the results obtained and the conclusions reached by the individual assistants, but in no wise would he detract in the least from the value of their results, or the ability shown by each. It should be stated that in the organization of, the survey as above mentioned it was contemplated that the work of the various assistants should be done without financial compensation, as no provisions have been made by the Legislature for such. Few, if any, instances can be found in the annals of America where so many able men have contributed so much of their time to the material development of their state. Our state as a whole is the gainer, but it should not forget their generous gift of time and ability. Finally, acknowledgments are made and sincere thanks returned to the many persons not already named who have assisted in the preparation of this volume; to Chancellor F. H. Snow and the Board of Regents for their assistance and warm interest shown in the work, to the various companies and individuals who are prospecting for oil, gas and other products in various parts of the state and have in that way drilled deep wells all of whom have uniformly responded to my every request with great kindness and-manifested the greatest interest and willingness to assist in the work undertaken; to the various railroad companies operating in the state, especially to the Atchison, Topeka & Santa Fe, the Chicago, Rock Island & Pacific, and the Union Pacific for assistance rendered; and finally to Miss Hattie M. Huntsman, Mr. R. W. Carter and Mr. H. H. Johnson for the skillful manner in which the many drawings were made that accompany the report. University of Kansas, November, 1895. By the organization of a University Geological Survey of Kansas a full and complete geological survey of the state is contemplated. The work will necessarily have to be done with relative slowness, which may not prove to be a disadvantage. It is expected that it will be done by the members of the University faculty, their advanced students, and other individuals, citizens of the state or otherwise, who are willing to give their time and energies to the state a few months of the year in assisting to carry on investigations interesting and scientific in character, and valuable in many ways in their results, the compensation for which is to be an increase in the knowledge of nature, an opportunity to study geology in the field, a medium of publication by means of which they may have their labors brought before the world, and a consciousness of having added a mite to the "increase and dissemination of knowledge among men." Since the University has opened a graduate department in geology and paleontology it may not be a vain hope that the Survey will help to build up these departments, and thereby produce a reactionary good in addition to those above named. It is contemplated by the Board of Regents that the interested departments in the University will severally be responsible, not only for the work accomplished under the departments, but for the degree of energy and zeal with which it is prosecuted. Each will therefore be expected to issue reports from time to time on the work done, reports covering greater or lesser subjects or natural divisions of the great science of geology, At the outset it was agreed by all that the investigations in general stratigraphy, areal boundaries, and allied subjects should be taken up first, after which other divisions should follow in natural order. The present little volume is the first result of the execution of the plans just outlined. It has been prepared by the Department of Physical Geology, only such features of Paleontology being used as seemed to be a necessary adjunct. It covers the whole of the Coal Measures and the Permian of the state, and is general rather than detailed, yet not generalized to any degree. That is, the various accompanying plates are all drawn to an exact scale, and represent conditions actually revealed on the surface or beneath the surface by deep borings. No "generalized" or "composite" section is given excepting plate XXII a generalized section of the Carboniferous and figure 11 in the text. It is fortunate that the recent activity in prospecting for oil and gas in the state was begun prior to the organization of this Survey. We now have positive knowledge regarding the underlying stratification for a large area in the eastern part of the state which otherwise could have have been known only by inference. A report of the work done the past summer for the State Board of Irrigation will appear under the auspices of that Board, but quite naturally a great deal of stratigraphic and general geologic data were gathered which can best be used by this Survey. It is hoped that by the close of another season we will be able to prepare a companion volume giving the stratigraphy of the Cretaceous and the Tertiary in a similar manner, a large portion of the material for which is already obtained. Considerable progress has likewise been made on a third volume to be devoted principally to economic questions, including a detailed account of the geology, technology chemical and physical properties, and economic importance of the coal, oil, gas, salt, and gypsum of the state. This may very naturally be followed by a report on the building materials, mineral paints, soils, mineral waters, etc., on all of which some work has been done, but not enough to admit the formation of definite plans regarding the report. The department of Paleontology has likewise already accumulated large quantities of materials, so that within a year or two it will be able to issue a report on the paleontology of the state which, from every consideration will be an important series of volumes. For as is well known, our state is exceedingly rich in both animal and plant remains. It cannot be decided what particular lines of detailed investigations will be taken up after the general ones above mentioned shall have been completed; possibly detailed descriptions by counties, or by areas limited by latitude and longitude; possibly the policy will be to follow themes rather than areas. In any event it is proposed to be sufficiently deliberate to insure scientific accuracy, and yet sufficiently rapid to bring the important discussions before the citizens of the state with expedition so that benefits may be realized early. For the present at least the octavo volume will be the style of publication adopted. Bulletins, the recent form of overflow publications so generally adopted in America, are unnecessary, because our University Quarterly, a regular publication, meets such requirements. It should be remembered by the scientific reader that these reports are intended primarily for the masses of the citizens of Kansas, and that therefore an elementary character must be preserved, not however, it is hoped, at the expense of scientific accuracy, Divers elementary explanations must be given, and rudimentary principles, however well known to the scientist, must be elucidated, even to the frequent repetition of long used illustrations. But it is earnestly hoped this will not result in unnecessary repetitions, or in any other act which may give them a "padded" appearance. Placed on web June 1, 2017; originally published 1896.